A.D. 896. This same year the plunderers in East-Anglia and Northumbria greatly harassed the land of the West-Saxons by piracies on the southern coast, but most of all by the esks which they built many years before. Then King Alfred gave orders for building long ships against the esks, which were full-nigh twice as long as the others. Some had sixty oars, some more; and they were both swifter and steadier, and also higher than the others. They were not shaped either after the Frisian or the Danish model, but so as he himself thought that they might be most serviceable. The extract above is taken from The Anglo-Saxon Chronicle (Annals from A.D. 881 to A.D. 898) and arguably marks the beginnings of England’s sea power. It took another 500 years however before a regular English fleet – a ‘Navy Royal’ – came into being. It was the activities of James IV of Scotland that let Henry VIII to form the standing Navy Royal, with its own secretariat, dockyards and a permanent core of purpose-built warships. 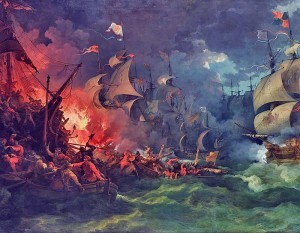 Henry inherited a small fleet headed by two large carracks (ocean-going merchantmen distinguished by high super-structure fore and aft) called the Regent and the Sovereign.